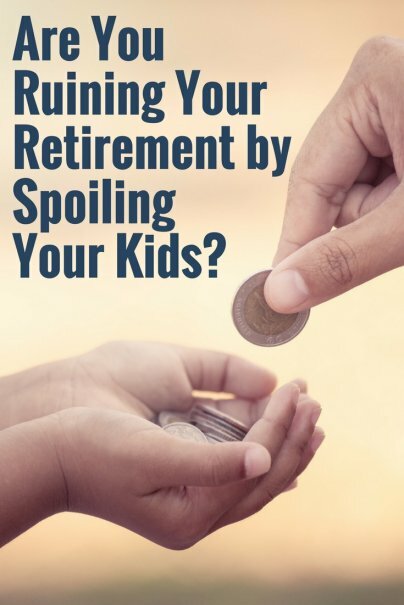 Home » Personal Finance » Are You Ruining Your Retirement by Spoiling Your Kids? It's true that most parents would do anything for their kids, and giving them money is no exception. Parents are all too willing to hurt their own financial health to provide a more comfortable life for their children. When parents spend too much on their children, they can easily damage their own chance of enjoying a stable retirement. The best approach is to help your children when they need financial assistance, but be wary of providing so much help that you're hurting your own financial picture. That could, in turn, make you a financial burden on your children in the future. Parents aren't shy about extending financial assistance to their children and family members. A 2017 report from Merrill Lynch and Age Wave, Finances in Retirement: New Challenges, New Solutions, found that 48 percent of Americans age 50 years and older are willing to overextend themselves financially to provide their children with a more comfortable life. The survey also found that 60 percent of these respondents would delay their retirement, and 40 percent would return to the working world after retiring, if they needed to provide extra financial support to family members. In fact, the majority of respondents had provided financial support in the past year, for an average amount of $6,500. There's nothing wrong with helping a family member in need, of course. The problems begin when parents give so much to their children and other relatives that they run the risk of not having enough for their own retirement. Many parents really begin to hurt themselves financially when their children are ready to attend college. They do this by spending too much of their own money to help pay for their children's education, often dipping into their retirement savings or putting off saving completely. This isn't surprising, given the high tuition rates at colleges across the country. The College Board reported that the average cost of tuition and fees for the 2016–2017 school year was $9,650 for state residents at public colleges, and $33,480 for private colleges — not including the cost of room and board. This is important: Parents can help their children financially, but they are under no obligation to ruin their own finances doing so. It's difficult for parents to do, but sometimes the best answer to an adult child asking for extra money is to say, "No." If you're wondering if you are giving your children or other family members too much money, take a close look at your own finances. Are you on track to meet your retirement goals? Are you struggling to make all your monthly payments on time? Are you running up credit card debt too quickly? If so, you might need to be less generous with your family members. The Merrill Lynch study said that adults should work with their children and family members to provide them with a financial education that will help them make better money decisions. They should also encourage their children to attend more affordable state schools rather than private colleges. Keep in mind how much money you can afford to give or loan to family members without compromising your own retirement. After all, you don't want to become a financial burden to your children in the future by spending too much today.